The VirtuCLEAN CPAP Cleaner automatically cleans your CPAP or Bi-Level machine using ozone, also known as activated oxygen, in only 30 minutes. The VirtuCLEAN is ready to use right out of the box--no maintenance or extra accessories required. The VirtuCLEAN kills 99.99% of disease-causing pathogens such as mold, bacteria and viruses that grow on the CPAP mask, hose, and water chamber. Just follow a short and simple two-step process to sanitize your CPAP equipment. The VirtuCLEAN is ultra quiet, universally compatible with all CPAP and Bi-Level machines, and is all you need to clean your sleep apnea supplies--no cleaning solutions or additional maintenance required. The VirtuCLEAN measures only 4.75" L x 3.75" W x 2.12" H, taking up very little nightstand space and can easily be transported anywhere. 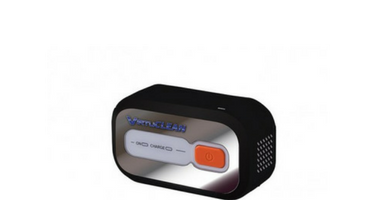 It only weighs 0.5 lbs, making the VirtuCLEAN the perfect CPAP cleaner to take with you when you are traveling. Keep your CPAP or Bi-Level clean even when you are away from home. Instead of having to worry about an electric outlet or the voltage, the VirtuCLEAN runs on a rechargeable lithium ion battery with a 10-year life. Each charge should give you no less than 7 full cleaning cycles. Recharging is easy through any USB port or through an AC outlet using the USB adapter.